The Liebers: Happy birthday, sweet boy! My dear, sweet little boy turned TWO! It seems like he was just born, and then I blinked and he was two. He is growing up into such a little personality! 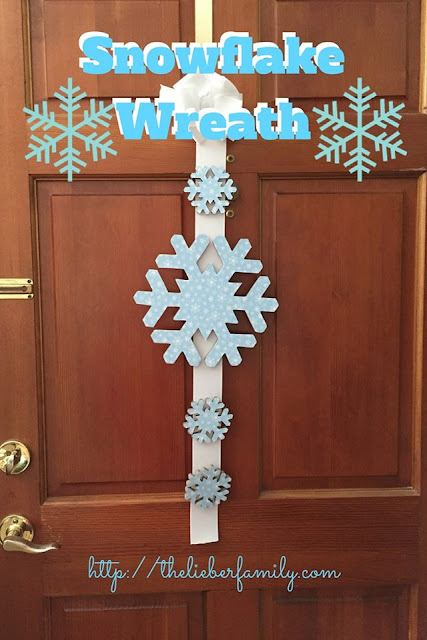 We did not have a big family get together, mainly because things have been really busy around the home front because of the end of the school year. We had our graduation breakfast at church the day before his birthday and then I will be out of town the next three weekends for vacation. We did celebrate together on Sunday afternoon with Mommy, Daddy, and Frances. 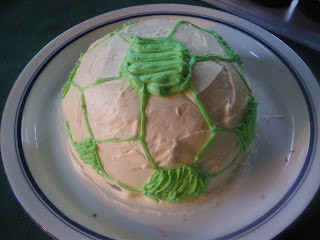 I made him a soccer ball cake and had enough cake batter left over for a set of cupcakes to take to school. 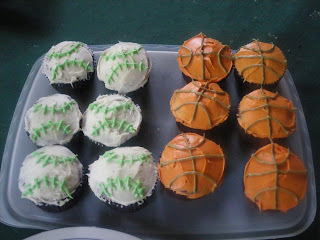 They were baseballs and basketballs. 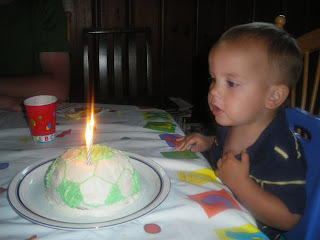 He loved the cake and blowing out his candles. He also had to blow out the jar candle on the dining room table while he was at it! 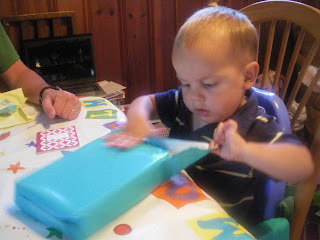 He opened some presents with a little help from Frances. He got a cute outfit from my parents, a truck, a set of Clifford DVDs that will come in handy when we drive to Raleigh next weekend, a CARS sheet and pillow case for his crib, and a farm set that includes a milk maid, and two cows (lately he has gone everywhere with "mama moo" and "baby moo"). 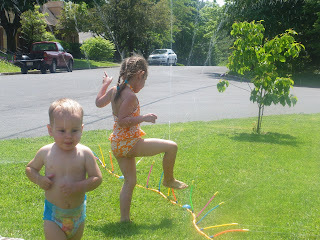 I found this super fun sprinkler at Target and decided to buy it for the kids for the summer and call it a birthday present. It is 12 feet long with little hoses sticking up that spray water all over the place. The water doesn't come hard sharp, like I thought it might. Henry even went up and drank straight out of it! I don't have his exact stats because his "2-year" check up was last month, but he is growing right on track. He LOVES to eat! He shampoos his hair at the table most nights, and often licks his plate clean...literally! He talks more and more, and I can generally understand most of it. He can repeat words more easily, but does not always add them straight to his vocabulary. He loves to ride in Daddy's truck and in the bike trailer. He loves to be outside and play with balls. He is full of energy, but sleeps well at nap and night to re-energize. He loves his teachers at school "A-yel" for Ariel and "Jeffy" for Jennifer. He is starting to name his friends for me when we get there in the morning. He likes to clean up and put things away. Unlike most kids his age, he doesn't not put a lot of stuff in his mouth. If he finds something questionable on the ground he will bring it to me to ask about it. He loves it when I tell him to put something in the trash. He likes to grab my hand and take me places. He LOVES to be read to and picks out different books from the shelf every night. He still sleeps in a crib, mainly because we have no room for anything else. It has never occurred to him to try and climb out, but we did have to move him away from the wall at night because he will turn on the light when he decides he is done sleeping, regardless of what time it is. His sister does not appreciate that! aww, great post. Happy B-day Henry!